The Wee Kim Wee Centre is proud is to present Our Third Annual Distinguished Lecture on Educational Leadership on Friday, 24th March 2017. 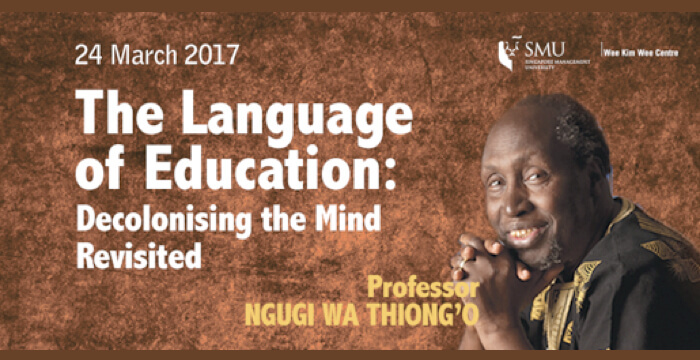 This year’s Lecture will be delivered by the Distinguished Professor Ngugi wa Thiong’o. With the generous support of TVI (Training Vision Institute), the Annual Wee Kim Wee Distinguished Lecture on Educational Leadership has been set up under the auspices of the Wee Kim Wee Centre here at SMU. This is the 3rd session out of a series of five. The previous two lectures were delivered by Lord David Alton and Datin Paduka Marina Mahathir. This year we are so very honoured to have Professor Ngugi wa Thiong’o, East Africa’s Leading Novelist, essayist, playwright, journalist, editor, academic and social activist to address us. Ngũgĩ has frequently been regarded as a candidate for the Nobel Prize in Literature and is considered a *living great* in the world of letters. Thousands of students around the world have studied his novels as texts for various O-level, A-level and university examinations. A Grain of Wheat, The River Between, Weep Not, Child, are just three of his very well-known works. Our lecture series is based broadly on the theme of Educational Leadership which involves working towards improving educational processes in order to facilitate improvement and positive change in our communities. We believe no one exemplifies this more than our honoured guest. Decolonising the Mind: the Politics of Language in African Literature (Heinemann Educational, 1986) is Ngugi’s collection of non-fiction essays about language and its constructive role in national culture, history, and identity. The book, which advocates linguistic decolonisation, is one of Ngũgĩ’s best-known and most-cited non-fiction publications, helping to cement him as a preeminent voice theorising the “language debate” in post-colonial studies. Decolonising the Mind is both an explanation of how he came to write in Gikuyu, as well as an exhortation for African writers to embrace their native tongues in their art. The foreign languages most African authors write in are the languages of the imperialists — English, French, and Portuguese — that were relatively recently imposed on them. Ngugi rightly complains that an educational focus that embraced essentially only foreign works (not only foreign in language, but also in culture) was destructive. Thus language and literature were taking us further and further from ourselves to other selves, from our world to other worlds. As Education is the key for the training of consciousness the *language* of education becomes critical in terms of the formation of deep-rooted and deep-seated attitudes and embracements. Thus the focus on Educational Leadership working out new frames for us, for society vis-à-vis the way/s in which we perceive and understand and construct our realities. **Please see the link here to view the article that was written about our speaker in the Financial Times, dated 16 November 2016. Ngugi wa Thiong'o is currently Distinguished Professor of English and Comparative Literature at the University of California, Irvine, He is the recipient of ten Honorary Doctorates. Ngugi burst onto the literary scene in East Africa with the performance of his first major play, The Black Hermit, at the National Theatre in Kampala, Uganda, in 1962, as part of the celebration of Uganda’s Independence. In a highly productive literary period, Ngugi wrote additionally eight short stories, two one act plays, two novels, and a regular column for the Sunday Nation under the title, As I See It. One of the novels, Weep Not Child, was published to critical acclaim in 1964; followed by the second novel, The River Between (1965). His third, A Grain of Wheat (1967), was a turning point in the formal and ideological direction of his works. In 1967, Ngugi became lecturer in English Literature at the University of Nairobi. He taught there until 1977 while, in-between, also serving as Fellow in Creative writing at Makerere (1969-1970), and as Visiting Associate Professor of English and African Studies at Northwestern University (1970-1971). During his tenure at Nairobi, Ngugi was at the center of the politics of English departments in Africa, championing the change of name from English to simply Literature to reflect world literature with African and third world literatures at the center. The year 1977 forced dramatic turns in Ngugi’s life and career. His first novel in ten years, Petals of Blood, was published in July of that year. The novel painted a harsh and unsparing picture of life in neo-colonial Kenya. The same year Ngugi’s controversial play, Ngaahika Ndeenda (I Will Marry When I Want), written with Ngugi wa Mirii, was performed at Kamirithu Educational and Cultural Center, Limuru, in an open air theatre, with actors from the workers and peasants of the village. Sharply critical of the inequalities and injustices of Kenyan society, publicly identified with unequivocally championing the cause of ordinary Kenyans, and committed to communicating with them in the languages of their daily lives, Ngugi was arrested and imprisoned without charge at Kamiti Maximum Security Prison at the end of the year, December 31, 1977. After Amnesty International named him a Prisoner of Conscience, an international campaign secured his release a year later, December 1978. In exile, Ngugi worked with the London based Committee for the Release of Political Prisoners in Kenya, (1982-1998), which championed the cause of democratic and human rights in Kenya. In between, he was Visiting Professor at Byreuth University (1984); and Writer in Residence, for the Borough of Islington, London (1985) and took time to study film, at Dramatiska Institute, Stockholm, Sweden. (1986). After 1988, Ngugi became Visiting Professor of English and Comparative Literature at Yale (1989-1992) in between holding The Five Colleges (Amherst, Mount Holyoke, New Hampshire, Smith, East Massachusetts) Visiting Distinguished Professor of English and African Literature (Fall 1991). He then became Professor of Comparative Literature and Performance Studies at New York University (1992 –2002) where he also held the Erich Maria Remarque Professor of languages, from where he moved to his present position at the University of California Irvine. He remained in exile for the duration of the Moi Dictatorship 1982-2002. Ngugi has continued to write prolifically, publishing, in 2006, what some have described as his crowning achievement, Wizard of the Crow, an English translation of the Gikuyu language novel, Murogi wa Kagogo. Ngugi’s books have been translated into more than thirty languages and they continue to be the subject of books, critical monographs, and dissertations. Last updated on 04 Oct 2018 .